Mc Kees Rocks, PA Violin Lessons Near Me | Fun Classes. Top Tutors. Check out some of our most popular teachers near Mc Kees Rocks, PA including Pittsburgh, Murrysville, Wexford, Bethel Park and Coraopolis. I've been teaching violin for 11 years and my students have gone on to play with different ensembles. Within the first few lessons, you'll be able to play simple songs by reading and by ear and as time goes on you'll be able to play more complex repertoire. I specialize in classical, style but I can teach you different kinds of styles, typically use the Suzuki repertoire but I use a variety of method and books. I have the following tools available for your lessons: violin, computer program, sound system, Tuner and Metronome . I love working with students of all ages and experience levels and I can't wait to meet you! Music should never simply be a rote-learning process. We develop real artistry. My students learn how to interpret, transform, and create music. From the first lesson, we experiment with various musical "ingredients" and revisit these tools often as we move through a lesson series or repertoire. Students explore a variety of styles and learn to read, compose, and improvise. Students as young as five have created their own theme and variations on a favorite tune with these techniques. Susanna S. has over 25 years of teaching experience on violin, viola and cello in private lessons, small groups and school orchestra settings. Currently, she runs her own studio and is teaching weekly in person lessons at her home in Pittsburgh or online lessons. She offers 30, 45, 60, 75 or 90 minute lessons. 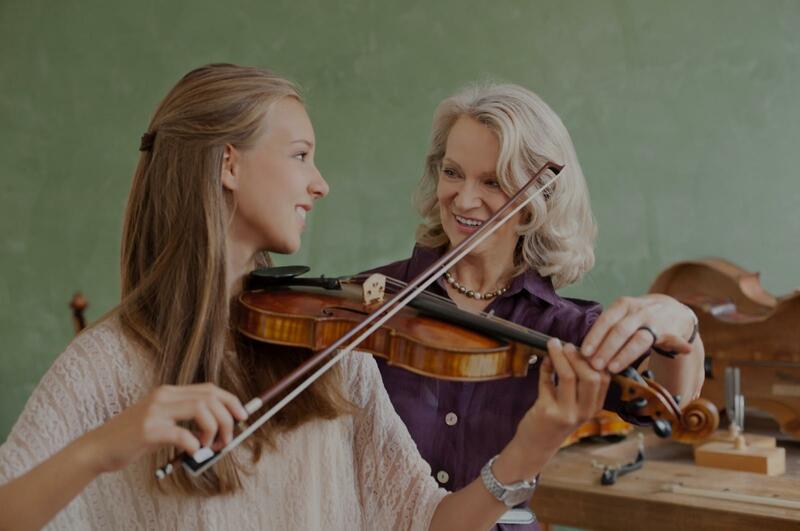 Susanna S. has helped students learn how to play their instrument, read music, understand music theory, improve their playing abilities on violin, viola, and cello, to successfully audition for youth orchestras, competitions, college auditions, NAFME/ASTA/PMEA events and to play for their own enjoyment. for music. In addition, she will provide instruction on music theory and music history as part of instrumental lessons as it applies. Susanna received her training at State University of New York at Purchase in 1991, where she received a Bachelors of Fine Arts in Music. In 1995, she received her Music Education K-12 Certification from Carnegie Mellon University. In 2000, she attended the University of Denver, Lamont School of Music where she received a Masters in Music. She has studied with Sol Grietzer, Karen Dreyfus and Basil Vendryes. In addition, Susanna earned a Masters of School Administration in 2012 from East Carolina University. Susanna recommends weekly lessons for all students to ensure good progress. She can provide information on purchasing or renting an instrument, if needed. Please ask questions and check Susanna's profile for availability. Teaching music is my passion! I have been teaching music for almost 25 years, and through those years I have learned that each student is unique. Everyone needs to learn the basics, but what music appeals to you? Do you want to learn to play classically? Are you interested in fiddling? Or do you want play your favorite pop tunes? We will work together to create the best musical adventure tailored to the student's needs! My passion is music! I have been performing as a musician most of my life, and I have been a music educator for almost twenty-five years. My main instruments are the violin and piano, but I also teach viola and voice. I received my degree from Youngstown State University, where I studied Mr. John Wilcox, former concertmaster of the National Symphony, and Dr. Robert Rollin, an internationally recognized composer. I have taught students as young as two up to the age of ninety. I can't wait to help you on your musical adventure! I have known Esther for years. She is well loved by both students and parents. She is dedicated and passionate. Her pedagogical prowess is made evident with each performance her students give. I give her my highest recommendation! I worked with Esther for many years, and I highly recommend her as a teacher. She has a professional, yet friendly rapport with her students. I have noticed that her students enjoy a close bond with her. She garners dignity, self-respect, and a love for performing music in her students. Ms. Esther Howard has been my violin instructor for many years now. I began my studies later in my life as a middle-aged-to-senior man. "Esther" has never ever made me feel inadequate or intimidated in the least while, at the same time, she has continued to encourage me to achieve skills I had never thought I could achieve when at certain times I might become discouraged or frustrated with myself. Ms. Howard teaches with endless patience and clarity. She personally demonstrates all of the skills and techniques on her own instrument, while guiding the student through the lesson. Ms. Howard is totally focused and engaged with her student during her lesson and utilizes lesson time to the maximum. She encourages continuous growth by teaching utilizing an organized and sequential method and by also encouraging her students to perform in periodic student recitals with family and friends present, which gradually moves her students to a higher level and gets them exposed to performing in a more formal venue. I have grown miles while studying under Ms. Howard, and am forever grateful for having found her as my violin instructor. Ms. Howard is a very kind person who is extremely skilled with several different musical instruments. She holds a degree in music from Youngstown State University (Ohio) and has performed professionally over the years in addition to her teaching. Ms. Howard is quite intelligent while also demonstrating a very good sense of humor as well. To any student considering her, rest assured that you will be put at ease and will greatly enjoy studying under Ms. Howard. More importantly, if you stay consistently dedicated to your studies, including consistently attending lessons and engaging in regular practice at home, you will absolutely continue to make significant strides along your path toward mastering your instrument! To sum it up, all I can say is that Ms. Esther Howard is AWESOME, AWESOME, AWESOME!!! Can't find a teacher in Mc Kees Rocks, PA? "Very good instructor with strong academic credentials!! Definitely a find for us after going through multiple instructors.... Definitely a keeper"
ng a beginner she tailored to me even with other students. I feel very comfortable and she goes out of her way to help those get it right even when they feel weak in the spirit about just starting. I would really recommend taking courses from her. Not only did I feel catered to, she also was very honest about her boundaries and what she was willing to do and put herself out there for. I am happy to have met this woman and look forward to taking private lessons to improve not my only my love for music but love for the violin." "Susanna does a very good job of making learning a new instrument not overwhelming. She takes it step by step and makes learning the violin much easier." "This is my first class, and it went much better than I thought. Susanna is a very nice teacher, she made my kid and i feel comfortable during the class." olin a lot of fun. I feel I have learned a lot just from a few lessons and look forward to learning even more with Susanna's help."